Staff Sgt. Jeremie S. Border, 28, of Mesquite, Texas, died September 1, 2012, by small arms fire while conducting combat operations in Ghazni Province, Afghanistan. Border was assigned to Company Alpha, 1st Battalion, 1st Special Forces Group (Airborne), Okinawa, Japan and was deployed in support of Operation Enduring Freedom-Afghanistan. Border graduated from Mesquite High School in 2002 and attended college at McMurry University in Abilene, Texas earning his Bachelor’s Degree in Sociology and Communications in 2006. He entered the Army in 2006 as an infantryman, where he completed basic training, advanced individual training and basic airborne course at Fort Benning, Ga. In 2006 he was assigned to 1-17th Infantry Division at Joint Base Lewis-McChord, Wash. 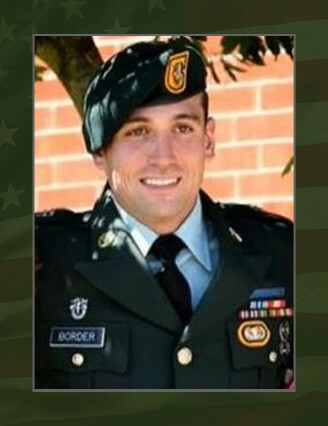 In 2008, Border was selected during the Special Forces Assessment and Selection Course as a SF weapons sergeant, and learned Indonesian at the Special Operations Forces Language Course at the United States Army John F. Kennedy Warfare Center and School. He was originally assigned to Company Bravo, 1st Bn., 1st SFG (Airborne), Okinawa, Japan in 2009 and was assigned to Company Alpha prior to his deployment in support of Operation Enduring Freedom-Afghanistan. Border’s military education includes the Special Forces Qualification Course, the Warrior Leader’s Course, the Advanced Leader’s Course, the Survival, Evasion, Resistance, and Escape (SERE) Course and the Basic Airborne Course. His awards and decorations include the Army Commendation Medal, the Army Good Conduct Medal, the National Defense Service Medal, the Global War on Terror Expeditionary Medal, the Global War on Terror Service Medal, Non-commissioned Officer Professional Development Ribbon with numeral 2, Army Service Ribbon, Special Forces Tab, Expert Infantry Badge and the Army Parachutist Badge. He has been posthumously awarded the Bronze Star Medal with Valor, the Purple Heart, the Meritorious Service Medal, and the Afghan Campaign Medal. He is survived by his mother, Mary Lynne Border, and sister, DeLaynie Kaye Roberts of Mesquite, Texas. For further information, media should contact the Special Forces Command Public Affairs Office during duty hours at 910-643-8438 or after duty hours at 910-429-4165.